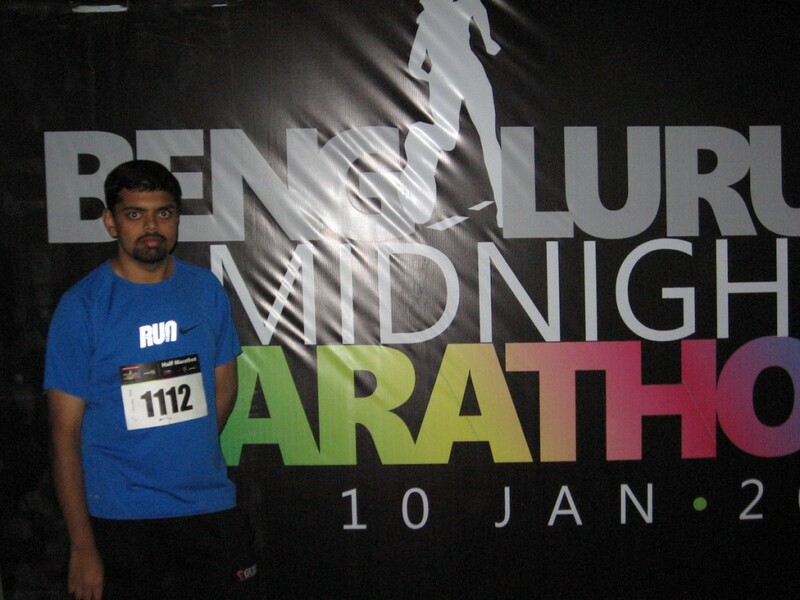 So, I prepared for midnight marathon..ran 15 kms well before a fortnight..but after that was again lazy. Ha! Some days ran only 30 minutes. A week before I wanted to run 15km again, but took a grand rest of 12 days..which was more than necessary and in a way bad. Anyways, coming to marathon..was quite confused what to eat, what to drink in the days just before marathon..also the amount of water to be consumed during runs..did lot of research..some a little too late.. However everything pointed to “what you are comfortable during your normal long run practices”..damn, I had just one long run. And, I had no different facility for that..i still ran around my usual field..I didn’t drink a drop of water till I came home..So I decided I will go without water for the same distance – around 15kms. Also of another concern was the shoes..I read, we should have 2 size larger shoes as feet tends to expand…there was no way I could change my shoes that lately-which were perfect fit – not bigger. Also, frequent blisters and lost nails, when I ran long distance were of concern. Plus since it was midnight – different than my schedule..eating, sleeping..everything mattered ..or so I thought. and the run started….i had forgotten watch..which meant I had to ask time at various points..more about that later. So I started and kept at my usual pace..which by my calculation was between 7-8kms in an hour..the first half of the lap looked interesting..except for the fact that everyone seemed to overtake me 🙁 some ran and walked..by which time if I had passed them, they again overtook me..hehe..so I just saw people going past me and despite my best efforts I seem to go very slow..which is happening in my life too currently. i wondered at some people wearing jackets..i had already started sweating profusely…due to excitement..due to fear..due to running. i saw people….elder to me..younger to me..faster than me..some slower than me..it felt good. as i don’t listen to music, i let my train of thoughts run..and my mind..circled the same old things..recalled happenings in last years..thought of dreams..past..future..past..future. i observed one thing apart from my pace which i felt was slower than my usual …the surface..the tar surface clearly notified the difference..i usually run comfortably in normal ground..on mud..but this was hard.HARD. instead of taking water from volunteers i asked time..one of the volunteers turned his glass of water he had held to offer, to see the time..that classical practical joke ..hehe..i felt bad and after that made sure i asked time to other people instead of those holding water cups..
i had roughly finished 5.5 kms at 12:45 ..45 minutes..which more or less was my pace..felt comfortable..kept the same pace..much before finishing first half, few probably Kenyans and few Indians had already started back..saw them on the way..roughly guessed their speed must be twice of mine..which means they might finish in less than 90 minutes..which is not heard of I thought..so the speed might get lower further down..
so wanted to pick up pace…but didn’t want to burn out..so i kept running at my pace..
and my train of thoughts at its pace..
the night marathon …(as against what i read about ultra) is boring in that, it is dark everywhere..nothing to see..
and as expected, the fast runners were on their 4th half..end of second lap..double my speed..
i during my normal practice runs…run continuously..not run, jog actually…but never walk..i have read many run-walk-run rules ..but i can’t keep count or follow it..because after walking, i feel lazy to jog again..
after sometime i asked time..i was told 1:15…clearly some where it was wrong..so i lost track of time..
so i kept jogging..but this third half was the longest…the end didn’t come at all…after half of it ( which is like 13.5kms) i was very tired..but i didnt want to stop or drink water till i finished the lap..
but i could not complete 3rd half..almost at end, i drank water…walked a little..stretched a bit…bent … took a leak…and then proceeded..i felt better..i guess i should have taken water little earlier..it gave me good feeling..
i tried to smile at people on the sides…like those security guards..or supporters..some smiled back and encouraged…but some guards looked puzzled..but i like to smile at random strangers and observe their reaction..hehe…so i continued to smile at people..
if i thought 3rd half was longer,never ending… 4th i knew would stretch to an eternity.. but i just wanted to finish it..not back out in between…in googlegroup, i was told “run,walk,limp,crawl…but finish that line and be happy that you did it..” that was only my motto..now i had become lazy to jog..and even if i did jog, i was so so so slow, slower than slow motion, despite the fact that i did jog, i was slower than those who walked..
now even my train of thoughts deserted me…i didnt know what was happening..i just wanted to finish..that smile too deserted me..i didnt become hopeful of finishing sooner as i had hoped in 3rd half..i knew the end might come after eternity..so mentally kept telling me lot more lot more distance to cover, but deep inside hoped, somewhat magically the end would appear just then…this again, i do in my life..i keep my expectations low only to make myself happy … but as these days, even low expectations are being turned into disappointments..so it happened here, my magical end line, didnt arrive, a second sooner against my deep hearted wish..wishes, i tell you. i felt comfortable walking..i felt bad that almost whole 6.5 or more i would be walking…much more than my target…probable reasons could be slower pace…also night food…or tar surface..or something else…. now along with time, i also started asking distance remaining…at one point i was told 2:30 and 2.5kms remaining..so i felt comfortable i might make it within 3 hours ..
i tried to finish this thing fast and tried to start slow jogging…but now, the left muscle had pulled…it was paining little…i did some stretches…but i realized if i jog, it gives time to pull and hence pain..
at one point i almost wanted to stop..not because of tiredness – i didnt get tired..just was pained.. i wanted to stop because the boredom had hit me again…this lack of motivation, again as in my life, is leaving me clueless..
but stopping too would pain the leg due to muscle pull..now i realized the importance of warm up or stretches before the run..
so there i was, i could not jog..i could not stop…so there was nothing i could do but to walk…i HAD to walk..whether or not i like it. haha. problem solved. now distance or time did not matter…because i knew, i just had to go whatever..there was no way i could quit after having come this long..and out of curiosity i asked distance..he said, just here half km…he was encouraging me or motivating me i felt..
i decided to consider it more than half…but hoped inside, that it could really be half km….but as usual, i was disappointed..the half km never seemed to get over..it felt more than the entire 3rd half !! also at this crucial junxture i promised myself a Chocolate fantasy if i finished this…aaah….not exactly motivation, cos there was nothing i could do -with or without motivation – but to walk..but a feel-good thought..
and finally i saw the crowd… i kept hejje-mele-hejje(foot upon foot) and proceeded..i saw someone munching something yummy in the spectator line..i looked at him ..he said “So you finished!” …i said “Yeah!!”.. what a feeling. feel it to know it. Just to convince myself, I wanted to look behind if someone was left ..but then I smiled at myself. It didnt matter. I had finished..well..and sound enough..thats all mattered. i wasn’t as broken as i had expected to be..
A halt to look behind, but dismissing that thought, smiling and moving ahead with an accomplished feeling…can’t express it in words. I was there too. Sad we didnt meet. But I ran 5km one.